Norman Thelwell was born in Birkenhead, Cheshire, on 3 May 1923. His earliest surviving drawing is a pencil self-portrait done at the age of 10, on which his teacher has written in red ink: ‘V. good indeed’. He remembers always wanting to draw as a child and recalls finding drawing and painting much easier than other subjects – ‘with drawing, the answer was always there in front of you – you only had to look’. His love of the countryside was fostered by childhood visits to a North Wales farm and was strengthened throughout his life. He joined the Army in 1941 and, through the years of war which followed, both in Britain and in India, he always travelled with his sketchbooks. The first cartoon he ever had reproduced was an Indian subject for the London Opinion. In 1945, at Nottingham Art School evening classes, he met fellow student Rhona whom he married in 1949. After the war, he took a degree course at Liverpool College of Art and in 1950 he started teaching design and illustration at Wolverhampton College of Art. His first cartoon for Punch was published in 1952 and led to a relationship which lasted for 25 years and over 1,500 cartoons, including 60 front covers. 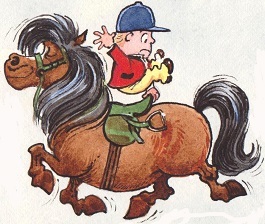 His first pony cartoon was published in 1953 and, by accident, led to a lifetime of association with the image of the little girl and the fat hairy pony. As he says in his autobiography: ‘I was a sort of unofficial country cartoonist, doing funny drawings that involved birds, cattle, pigs and poultry. One day I did a pony drawing and it was like striking a sensitive nerve. The response was instantaneous. People telephoned the editor and asked for more. Suddenly I had fan mail. So the editor told me to do a two-page spread on ponies. I was appalled. I thought I’d already squeezed the subject dry. I looked at the white drawing block and wondered what on earth to do. In the end I dreamed up some more horsey ideas and people went into raptures.’ The ‘Thelwell pony’ was born. 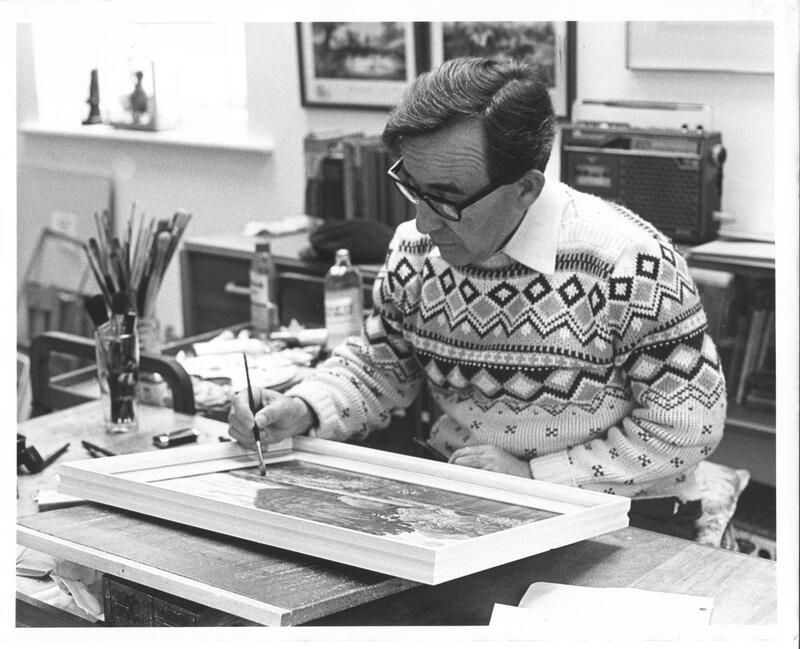 Thelwell left teaching to take up illustration full-time in 1956 and his first book, a collection of his cartoons, Angels on Horseback, was published in 1957. The first book produced from cover to cover rather than collected from drawings previously published was A Leg at Each Corner, published in 1961. This was serialised in the Sunday Express and led to the development of the strip cartoon characters Penelope and Kipper. 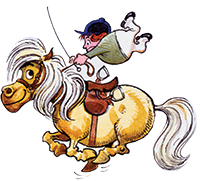 Thelwell’s range as a cartoonist has gone far beyond ponies – fishing, gardening, house-hunting, motoring, sailing, dogs, cats, farming, stately homes, children and country pursuits have all been given the treatment. He was a master of sharp social comment and sheer zany humour, and the foibles of the British at work or at play were his favourite themes. He was also a serious landscape artist, painting in watercolour and oils. His 34 books have sold over 2 million copies in the UK and been translated into languages as diverse as Finnish and Japanese and his drawings have been used on many different kinds of merchandise including stationery, jigsaws, table mats, china, glass, door mats, socks and bedlinen.